The Novation Cat Synth T-shirt is one of our unique designs available in our merchandise range! 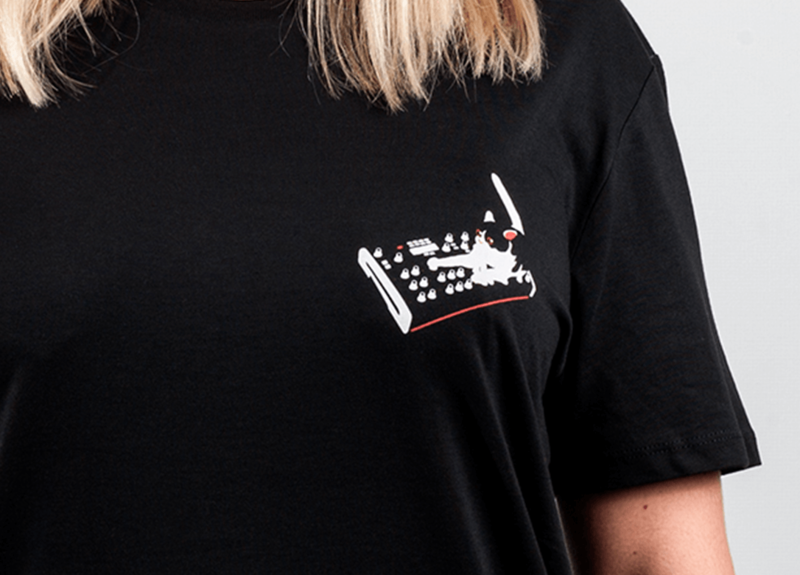 Made from 100% organic cotton, this unisex T-shirt has the Cat Synth design printed on the back and the Cat logo printed on the front. A red woven Novation label is stitched to the T-shirt hem. Be sure to check out our other T-shirt designs too! 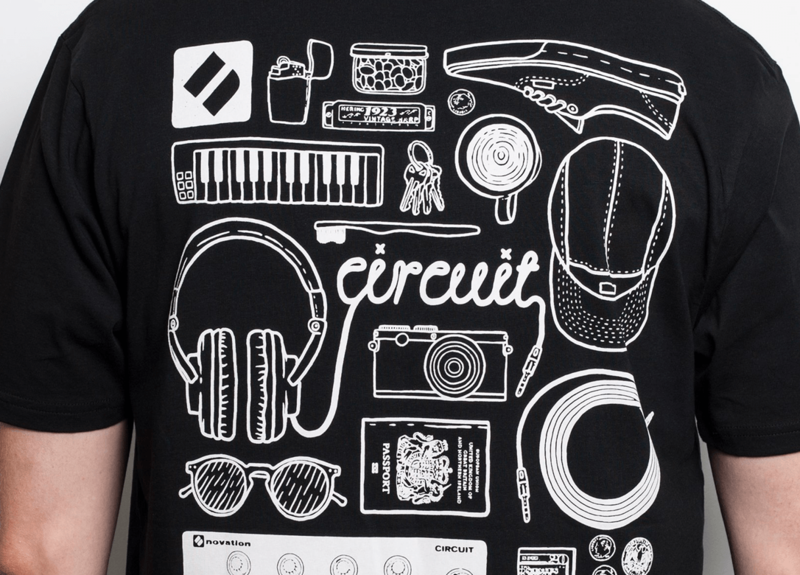 The Novation Circuit Traveller T-shirt is the first piece available in our merchandise range! Made from 100% organic cotton, this EarthPositive™ unisex T-shirt was manufactured solely using renewable green energy from wind and solar power. The Traveller design is printed on the back of the T-shirt, and the Novation logo is printed on the front. A woven Novation label is stitched to the T-shirt hem. Be sure to check back in as there's more to follow soon. 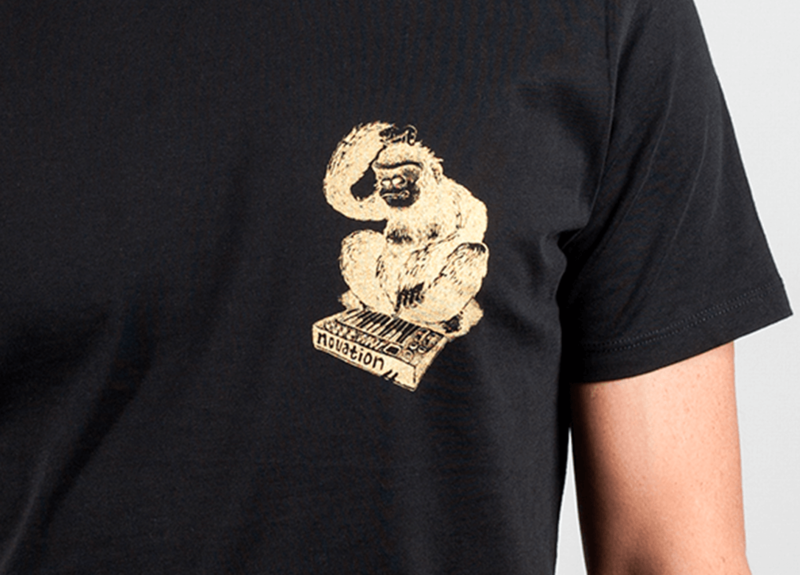 The Novation Gorilla T-shirt is another one of our unique designs available in our merchandise range! Made from 100% organic cotton, this unisex T-shirt has the Gold Gorilla design printed on the back and a smaller Gorilla logo printed on the front. A black woven Novation label is stitched to the T-shirt hem. Be sure to check out our other T-shirt designs too! The Novation Pill Bottle T-shirt is yet another unique designs available in our merchandise range! 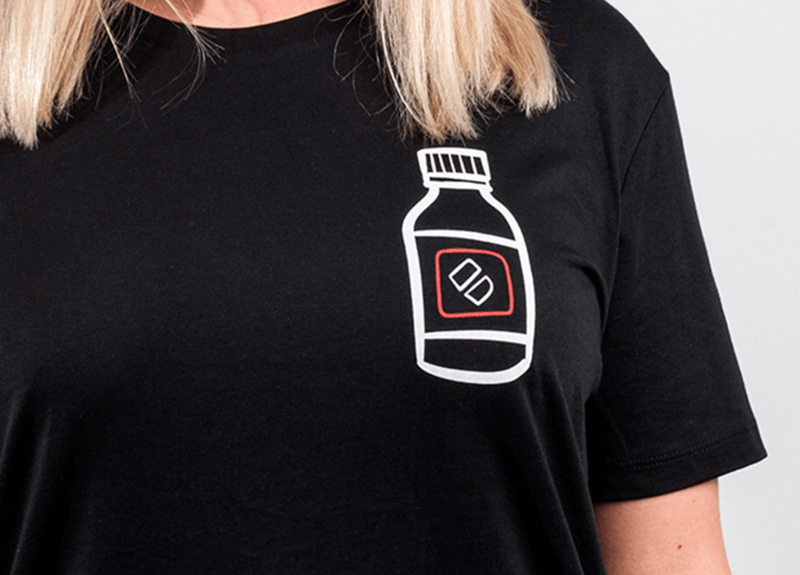 Made from 100% organic cotton, this unisex T-shirt has the Pill design printed on the back and a smaller pill bottle logo printed on the front. A black woven Novation label is stitched to the T-shirt hem. Be sure to check out our other T-shirt designs too! The Novation Logo T-shirt is now available in our merchandise range! Made from 100% organic cotton, this unisex T-shirt has the logo printed on the front. A black woven Novation label is stitched to the T-shirt hem. Be sure to check out our other unique T-shirt designs too!